The Golf Blog » Blog Archive » The Golf Blog: Will Tiger Woods be DQ’d for alleged improper drop on 15th hole at Masters? « The Golf Blog: Does Rules Official John Paramor need to retire from golf after Guan penalty? The Golf Blog: Will Tiger Woods be DQ’d for alleged improper drop on 15th hole at Masters? mulligan, 12 April 2013, Comments Off on The Golf Blog: Will Tiger Woods be DQ’d for alleged improper drop on 15th hole at Masters? Pro golfers Bob Estes and Keith Nolan are suggesting on Twitter the drop was improper. @bobestespga No doubt he took an illegal drop.Now it is up to Tiger to make this right. @jasonsobelgc CBS is talking about it now. Ferehty says it was ILLEGAL DROP while showing the tape. He combined option 2 And Option 3. So what did Tiger do wrong? Tiger didn’t elect option (a) because he dropped the ball a couple yards behind his divot, so it wouldn’t be “as nearly as possible at the spot” of the original shot. Tiger may have thought he was complying with option (b), but it appears that he may have been mistaken about the last line the ball crossed the water hazard. 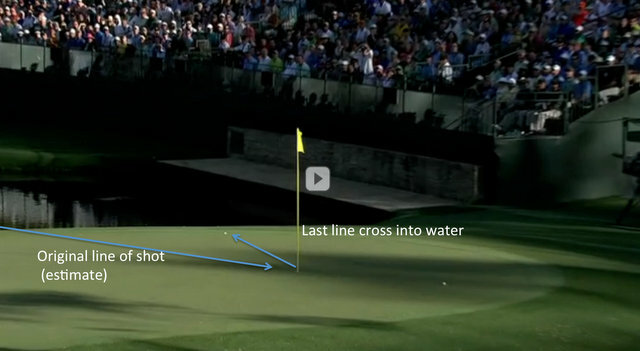 As John Lynch’s Dad blog explained, the point at which Tiger’s ball last crossed the water hazard may have been different from the line that it took when it first sailed over the water hazard onto the green. It last crossed the water hazard on the ricochet–which may have been a different line than the first. Here’s the video. The ball clearly bounces to the left of the original line of the shot. If it was a different line, then it does seem highly doubtful that Tiger could just go back 2 yards simply from his divot under Rule 26-1. The drop wouldn’t be on the last line the ball entered the hazard after the ricochet off the flag. Click here for the USGA’s explanation of “last crossed,” which explains how to determine the last line the ball crossed the water hazard if it did so several times. And here for more explanation. If it was an improper drop, as it appears it was, Tiger would be disqualified for signing an improper or erroneous scorecard (he should have assessed himself a penalty for the improper drop). We think the issue will be raised Saturday morning, given how Twitter is exploding with it. We hope, and pray, no rules infractions were committed–but, by all indications, it looks like Tiger did. Stay tuned. UPDATE: Hank Haney said on Twitter he thinks Tiger Woods may have committed a rules infraction. When he said he dropped 2 yards back i thought he had a problemRT @stevieo1974:there’s a lot of talk about Tiger’s drop on 15 being illegal? I’m worried, i think he was confused by the rule RT @brianmeise: Gut feeling – is Tiger ok or no? UPDATE: Tiger Woods escaped disqualification by a controversial ruling excusing him and imposing only a 2 shot penalty. Click here.